Since Nike announced in March their desire to separate from Chinese and Vietnamese suppliers, local newspapers have been on the lookout for the name of the factories concerned. According to the Vietnamese press the Sambo factory in Ho Chi Minh City will be affected. The local press, Vietnam News, announced the following story. Officially a Korean enterprise, Sambo has worked with Nike for the past fifteen years and employs around 6,000 workers – around 3% of the 200,000 Vietnamese who are working in the fifty Nike production sites in the country. As was announced at the end of March the American company will continue to buy from Sambo for a transition period of six to twelve months whilst the factory finds other clients. After a drop in profits of 47% this quarter Nike has started a revision of its activity, including a decrease of 4% in its workforce. 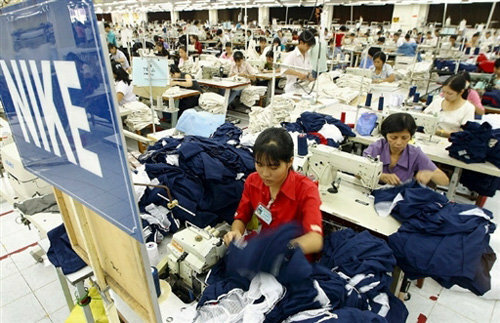 As a result, their Vietnamese producers should see a drop in orders between 15 and 30%.This scaling back comes after strikes last year at more than a hundred and twenty factories in the country; workers were demanding better working conditions and higher salaries in the face of unprecedented inflation.